The creative relationship between Aardman and Dreamworks was never destined to be a smooth one. While the partnership brought the great successes of Chicken Run and Wallace & Gromit: The Curse of the Were-Rabbit, there were rumblings behind the scenes on Flushed Away, suggesting that the American arm was trying to reshape the distinctly British product into something more mainstream and marketable. While Flushed Away isn't a bad film, it is among the weaker Aardman offerings, and among the lower points in Serkis' career. 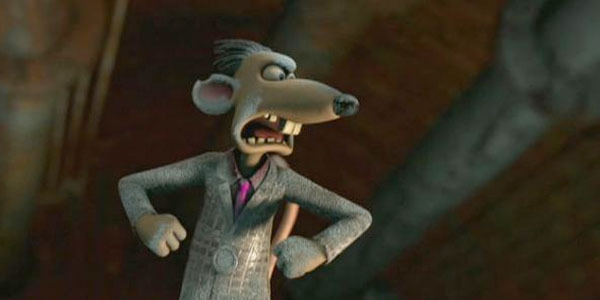 Flushed Away is a fish-(or perhaps rat-)out-of-water story involving pompous pet rat Roddy St. James (Hugh Jackman). When Roddy is flushed down the toilet into the sewers by sewer rat Sid (Shane Ritchie), he comes across a city resembling London but made entirely out of junk. Once there, he forms an unlikely partnership with sewer-smart scavenger Rita (Kate Winslet), and together they stop arch-villain Toad (Ian McKellen) from killing all the rats with liquid nitrogen. Considering how good he was in Burke & Hare just four years later, you'd think that Serkis wouldn't struggle with playing a comic criminal or henchman. But whether due to the generic script or the disruption behind the scenes, he is decidedly one-note as Spike. While the character design is in line with our expectations of Aardman, the character and his partner Whitey (Bill Nighy) feel like a lazy rehash of the Horace and Jasper dynamic in both versions of 101 Dalmatians. Put simply, Serkis doesn't do enough to lift the part above its conventional status, and that in turn makes the film less memorable.